Beneath the bustling streets of Brooklyn lies a cave filled with tons of cheese. Crown Finish Caves is located inside a 30-foot-deep tunnel in Crown Heights, Brooklyn. Cheese comes here to age, and it can take anywhere from a few weeks to 12 months for the process to be completed. The ageing itself is an old European practice called “affinage,” which is the ageing of new cheese, also known as “green cheese.” The caves are set at a stable 50 degrees Fahrenheit year round, which means that they are the perfect temperature for ageing cheese. 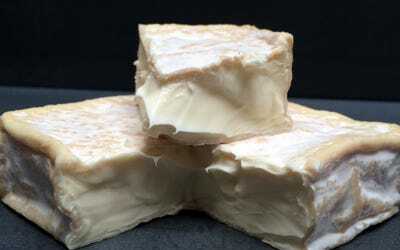 During this early period of ageing cheese, the flavour and texture develop and set. Each kind of cheese has a different set of requirements for temperature, humidity, and treatments. Most of their cheese is produced locally — 250 miles or less from NYC, although they sometimes receive shipments from Italy. When they get the cheese, it’s anywhere from 1 to 14 days old, when no rind has developed. The tunnels, which date back to the 1850s used to belong to a brewery. Today they hold as much as 22,000 pounds of cheese. Unfortunately, tours aren’t open to the public in order to prevent contamination or other sanitation issues. If you want to to see the daily operations of the tunnel, cheese ageing techniques, and what the facilities look like, you can follow Crown Finish Caves on Instagram.